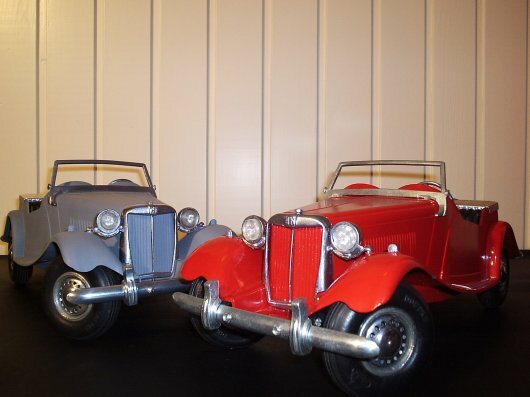 In 1947, Charles W. Doepke with his assistant and brother Fredrick started the Doepke Toy Company in Rossmoyne, Ohio. 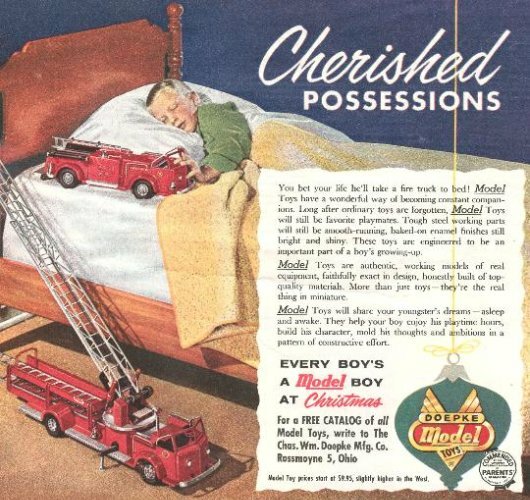 Being so soon after the conclusion of World War II, many toys available at the time reflected a war theme. In contrast to this trend, the Doepkes were encouraged by their grandmother to create toys that were not war-related. Since both men had previously worked in the steel industry, they were quite aware of the possibilities and were adamant about creating exact duplicates of then modern construction equipment and cars. 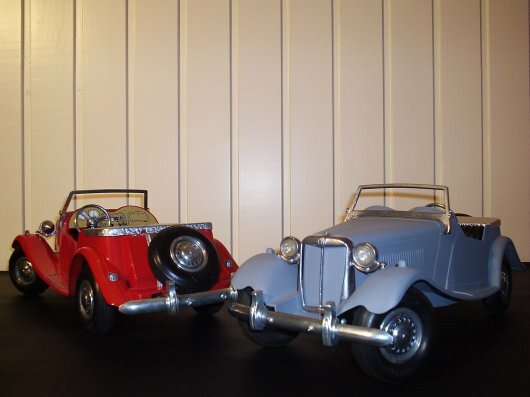 Doepke model toys have delighted kids for decades and are now the envy of toy collectors everywhere. 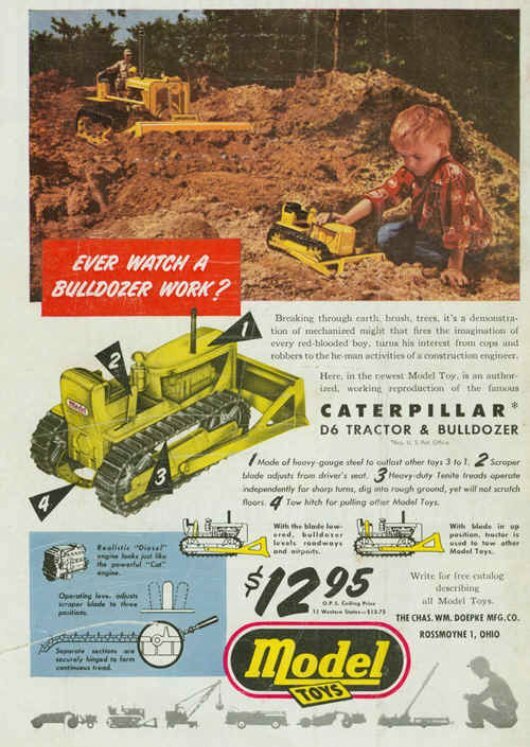 Based near Cincinnati, Ohio, Doepke made several different types of toys ranging from model automobiles such as the MG TD and Jaguar XK 120, a fire engine, and construction vehicles including bulldozers, graders, loaders, earth movers, and cranes. The toys are noted for their remarkable realism. 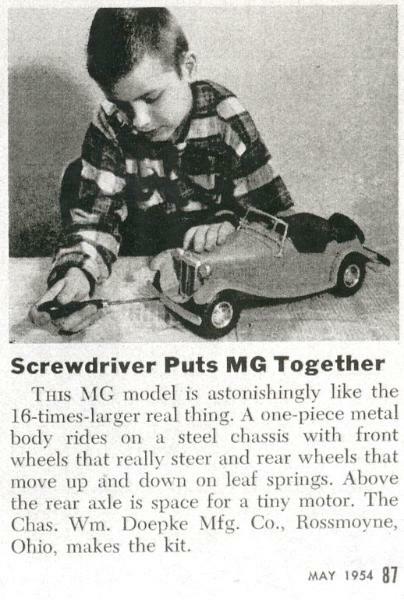 The popularity of Doepke toys among children in the 1950s was likely bolstered by their uncanny realism. Yet, this appeal was not necessarily limited to children. On many occasions, salesmen would carry Doepke toys with them to help with sales. "In one instance a model made by Doepke actually worked out a production flaw in its much larger relative." Said, the daughter of Charles Doepke in an interview. One of Doepke's best selling items was its steel crane, first manufactured in 1949. 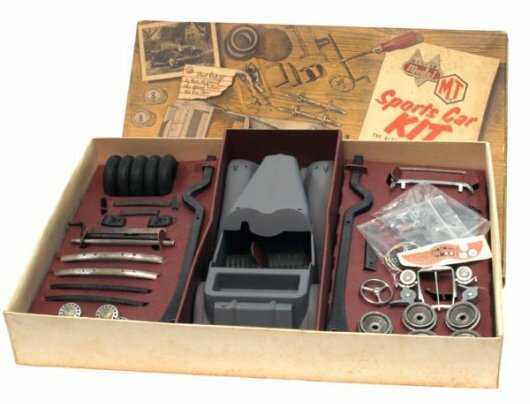 It was one of the most popular pressed steel construction toys ever made. 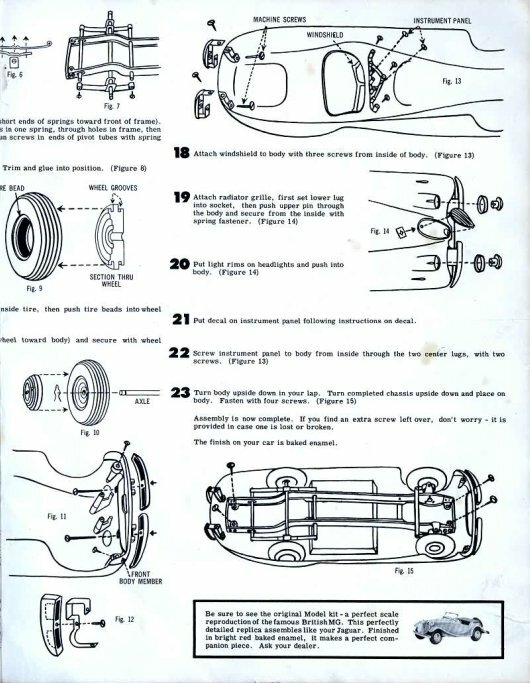 It was rugged enough to survive the rigors of outdoor use and had realistic details like rubber Goodyear tires. The toy had two functional hand crank hoists, accurate rigging, a stamped steel open lattice boom and a working clamshell bucket used for excavating. The toy was priced at $14.95. 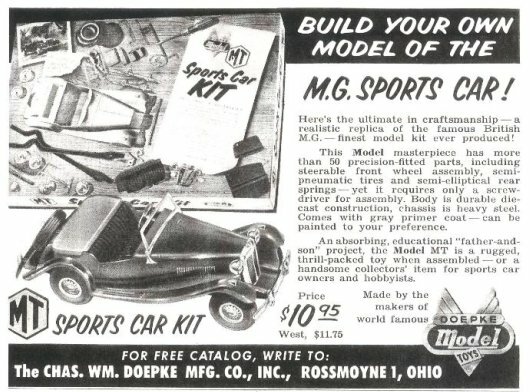 In 1960, due to an increase in steel costs and its inability to create the same realism with wood toys, Doepke was forced to shut down. 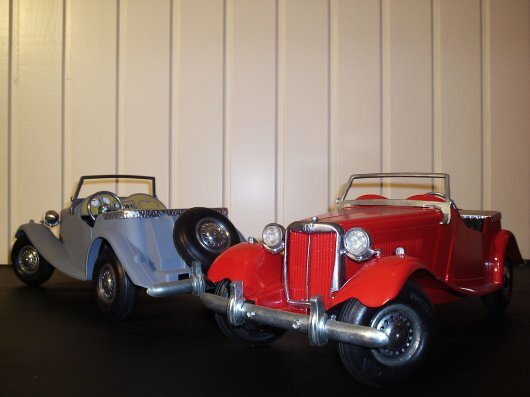 Today, there are many collectors of Doepke Model toys. 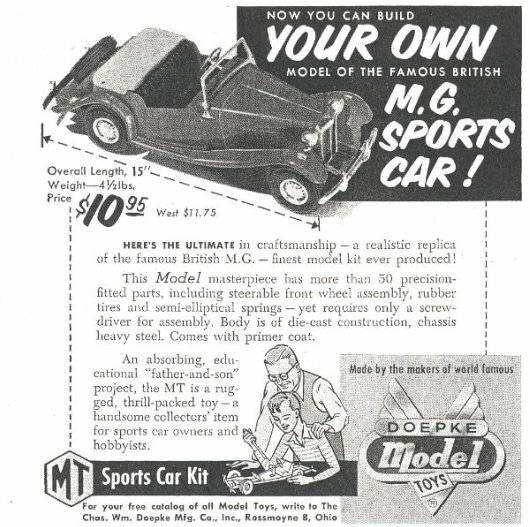 Introduced in the spring of 1954 the Doepke MT (MG) was an instant hit. It looked fabulous with its true-to-life detailing and its hefty size. The Doepke MT came in kit form. Early kits included a body that was left in primer, allowing the builder to add their own custom paint job. Later versions were primarily red, but there were also light yellow and black versions produced, these two colours are extremely scarce today. 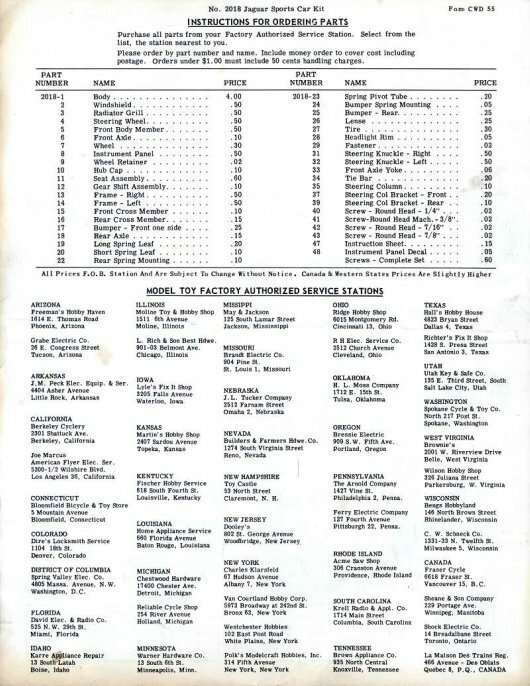 The Doepke MT (MG) production run was from 1954 to at least 1956. The scale is approximately 1:16. 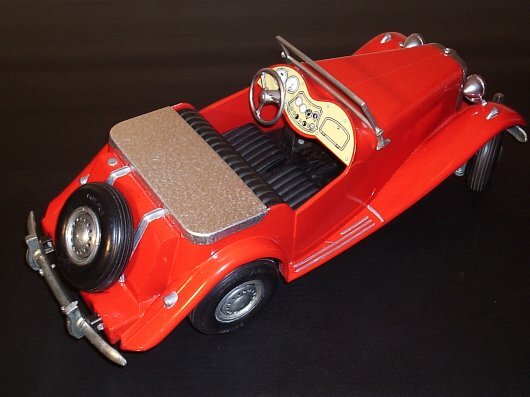 The MG TD of Doepke is most probably the nicest miniature MG TD ever made. 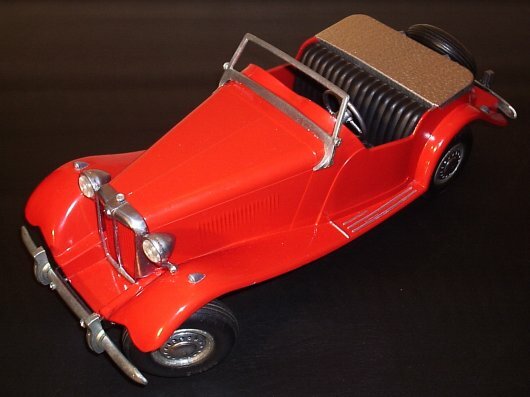 The Doepke MG TD contains a real chassis like the original MG TD, including real springs on the rear axle. 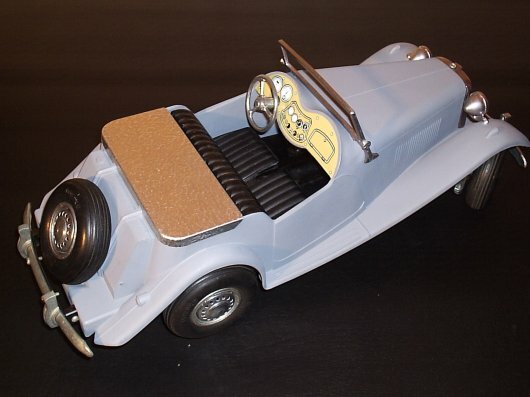 The dimensions of the model car are W x L x H: 14,3 cm x 39 cm x 23,5 cm, or 5 3/4" x 15 1/2" x 9 1/2". The cars have big rubber tyres indicated with Doepke and Doepke model logo. Doepke model code 2017 MT. 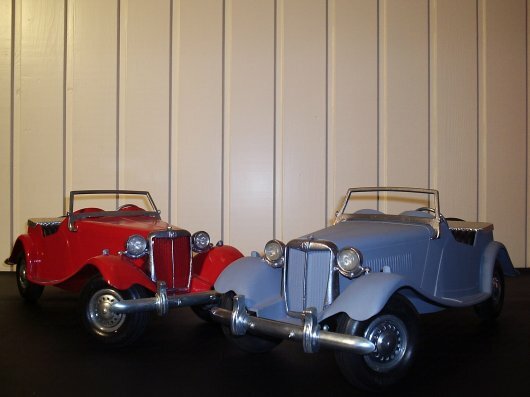 Are these models "small" MG TD's or is the MG TD a big Doepke ? 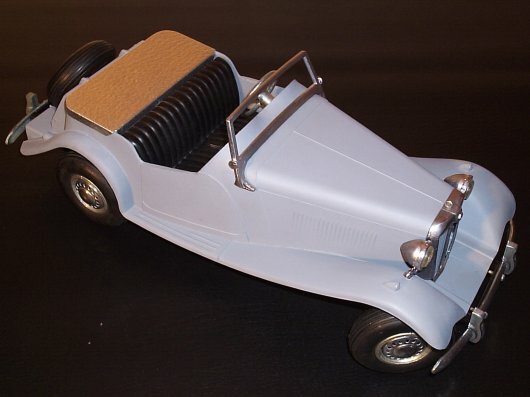 Original Doepke MT (MG TD) early type car kit, in Gray primer paint. 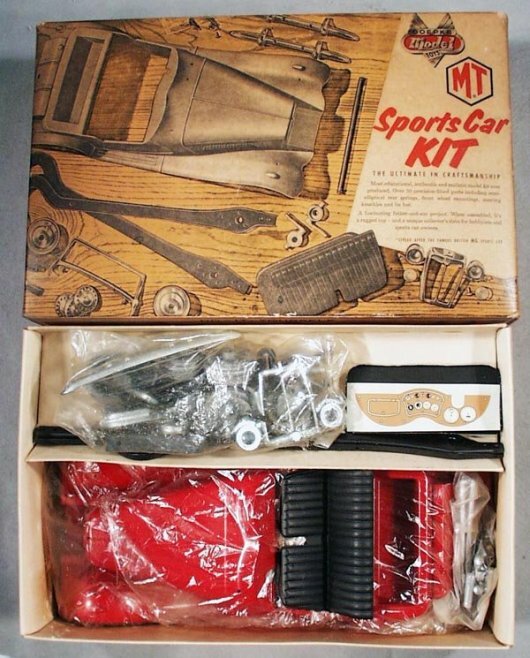 Original Doepke MT (MG TD) car kit later type, in MG Red paint. 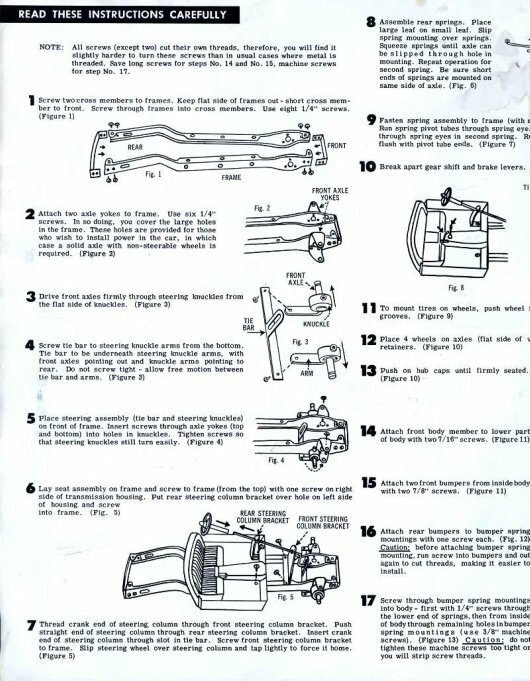 Below you will find the instruction manual for the Doepke MT (MG TD). This is a copy. These are the best scans I have available for the moment. If you have an original one, please provide me with some good scans if possible. Or make me a proposal for the original document. 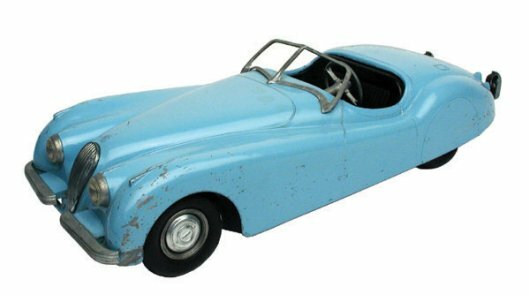 Introduced in 1955, the Doepke Jaguar proved just as popular as the Doepke MG TD. The Jaguar was offered in two colours, but original red ones are almost non-existent today. Baby blue is the predominant hue. Primed versions were not available, but fully assembled versions were. They came in a plain brown box similar to the Doepke construction toys. 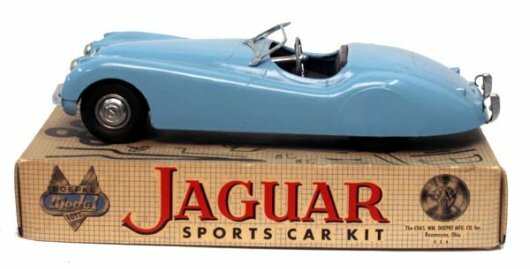 With real "style-setter" lines and realistic looking chassis details, the Doepke Jaguar was an enjoyable kit to assemble and a wonderful toy to play with. The dimensions of the Doepke Jaguar are W x L x H: 15,5 cm x 44 cm x 11,5 cm, or 6 1/4" x 17 1/2" x 4 1/2". The cars have big rubber tyres indicated with Doepke and Doepke model logo. Doepke model code 2018 Jaguar. 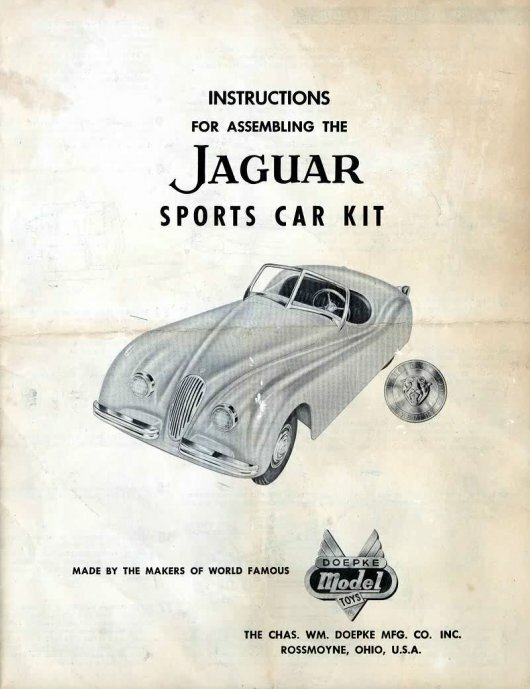 Below you will find the instruction manual for the Doepke Jaguar. This is a scan of an original document. 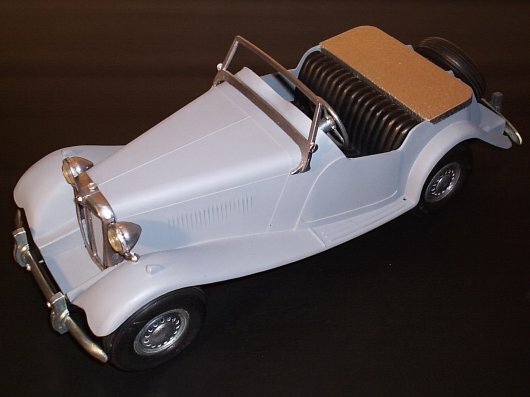 Below you will find images of my Doepke MG TD, this one is an early one still in original Gray primer. 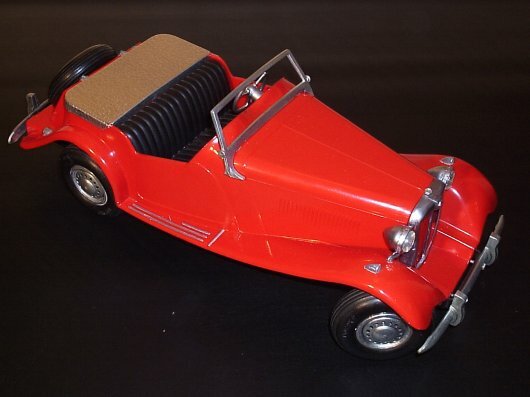 Below you will find images of my MG-red Doepke MG TD.